In this video, Marvin Moss of Cincinnati shares how, with the help of Jewish Family Service, he follows his mom’s footsteps into a more Jewish life. Narration: Marvin Moss has a developmental disability—he also has a hero: his mom. Marvin: [I was told] people like us, we don’t need to learn Jewish stuff. Narration: His mother raised Marvin to be Jewish and a fighter. Good thing, too. Due to his challenges, he was often excluded. Marvin: My mom helped start the mentally retarded group in Cincinnati [Dorothy Moss helped found The ARC of Ohio, which advances the rights of Ohioans with intellectual and developmental disabilities and their families.] I’ve helped people with handicaps all my life. My mom taught me to help people. Every day I’m dying to do it. Narration: With support from the Jewish Federation of Cincinnati, Marvin started taking Hebrew classes at Jewish Family Service Barbash Family Vital Support Center in Clifton. Marvin: My mom helped me to learn about the Jewish tradition. Now I’m going back to Jewish Family Service to learn about how to help myself be a better Jew. 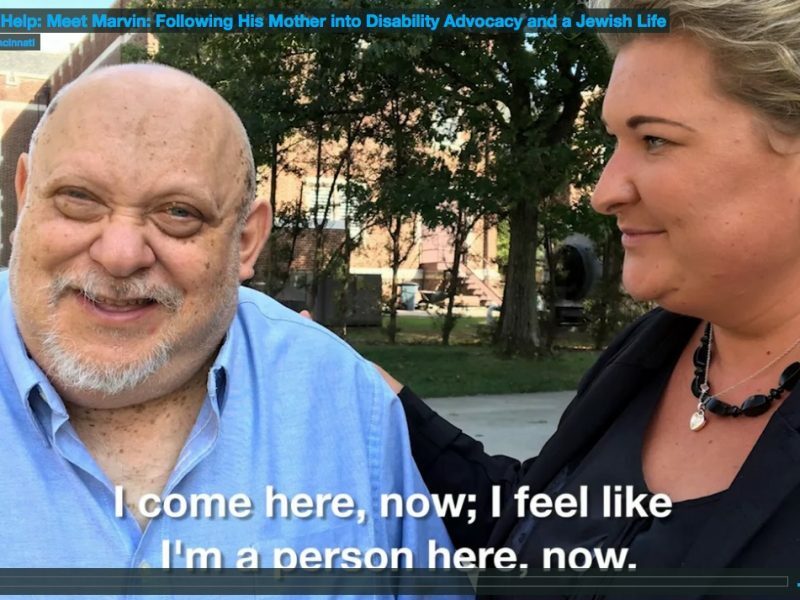 Narration: Marvin comes to Jewish Family Service for ongoing support that improves his quality of life. He comes for luncheons and holiday celebrations, and gets food at the Heldman Family Food Pantry here. Marvin: I come here, now; I feel like I’m a person here, now. Narration: Jewish Family Service, Jewish Family Service Barbash Family Vital Support Center, and the Heldman Family Food Pantry are three of over fifty programs and agencies funded in part by the Jewish Federation of Cincinnati. To learn more about Marvin’s story see this article.